Every other week, the Hivemind of Circle of Fountains meet. Who is the Hivemind? They're three covenmates who seem to be in about the same place in their lives: All married, all in the process of house ownership, all dealing with chronic illnesses and all traversing stability. And why do they meet? For both the mundane and the magical. To go to doctors appointments or to cast perimeter wards, to grab coffee or to hold a cord cutting ceremony. The Hivemind of CF is kind of like the elders of the circle in a way. We take care of what's needed and we've grown incredibly close in doing so. I'm not sure when Phaedra, Andrea and I started calling ourselves the Hivemind but it's the title of the group chat we participate in and what I mark in my planner when we're meeting. Most times, we huddle in someone's house in the late morning, drink coffee and gab about our lives. Phaedra's a stay-at-home mother of three dealing with fibromyalgia and gearing up to buy a house while in a poly relationship two husbands and a wife. Andrea is a security officer managing mixed connective tissue disease and narcolepsy who is childless by choice and just bought a house with her husband only a day before we purchased ours. And me? Well, you guys know me well enough to see why this little trio works so well. One of the many things we like to do during Hivemind meets is drink tea. 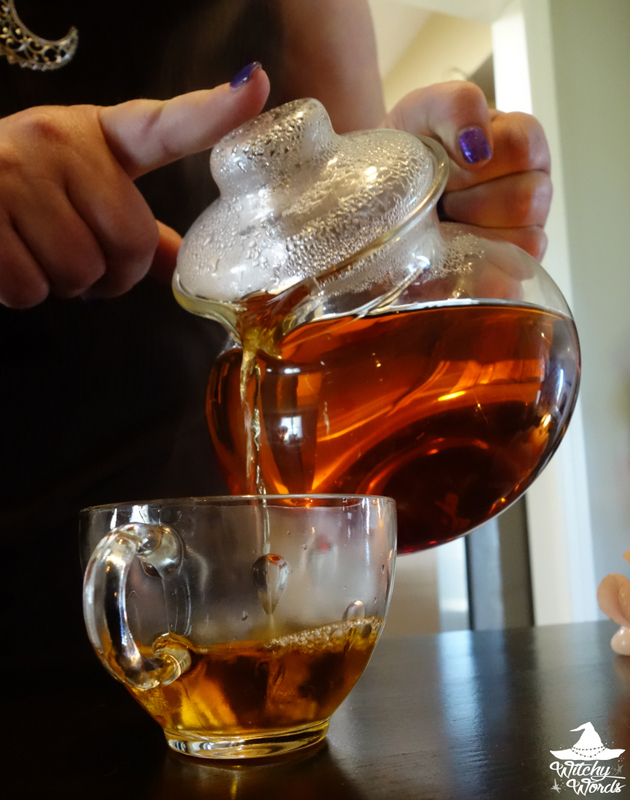 We've trekked over to a local tea house a few times for lunch and regularly bust out the teapot at home. So when Andy at Plum Deluxe asked me if I'd be interested in trying some of their teas, I popped up our chat and asked if they'd like to join me! Based in Portland, Oregon, Plum Deluxe offers organic, hand-blended loose leaf teas that are GMO-, chemical- and sulfite-free. Andy, the founder, created the company as a tribute to his late mother who lost a six-year battle with breast cancer but "never forgot to enjoy the little things in life." Because of this, Plum Deluxe encourages you to enjoy a "mindful moment" in a cup of tea, whether it be by yourself or with friends and family. The teas at Plum Deluxe come well packaged, featuring all of the ingredients and instructions on how to make the tea. I was highly impressed with this. Tea companies I've ordered from in the past regularly negate to include steeping instructions. While I'm experienced enough to be able to smell a tea and judge the temperature of the water and length of steeping, I'd much prefer to have it on the package, particularly for new tea drinkers wanting to get the full experience! You'll also note that this label includes correspondences. Phaedra, Andrea and I carefully mulled over the ingredients and agreed with the label. The tea features strong elements of love and marriage correspondences seen in the orange peels and strawberries while the bergamot oil of the Earl Grey and blue cornflowers promote peace and harmony. This tea is fantastic for gratitude, but could also be useful in circumstances of marital strife and relationship issues. The ingredients promote relaxation in the place of love. But that could also apply to relaxing with a group of friends, so that's the direction we decided to take it! 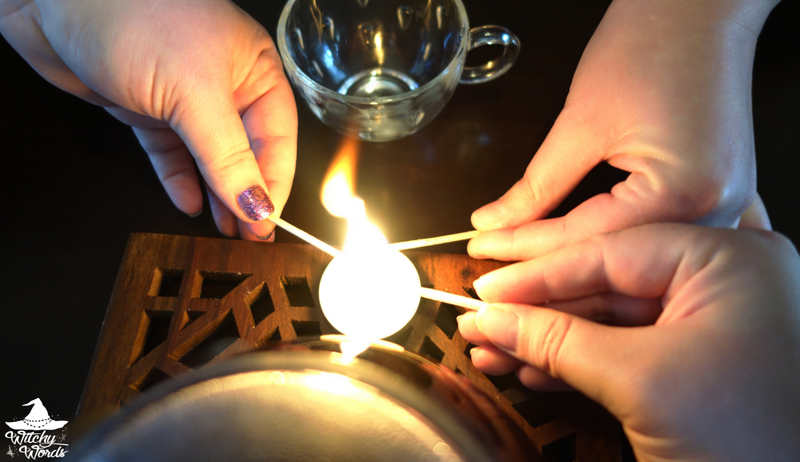 Once we decided on a purpose, Phaedra and Andrea scoured my ritual room for items we wanted to include on our altar as I started the water. We decided on the colors pink for friendship and yellow for communication. 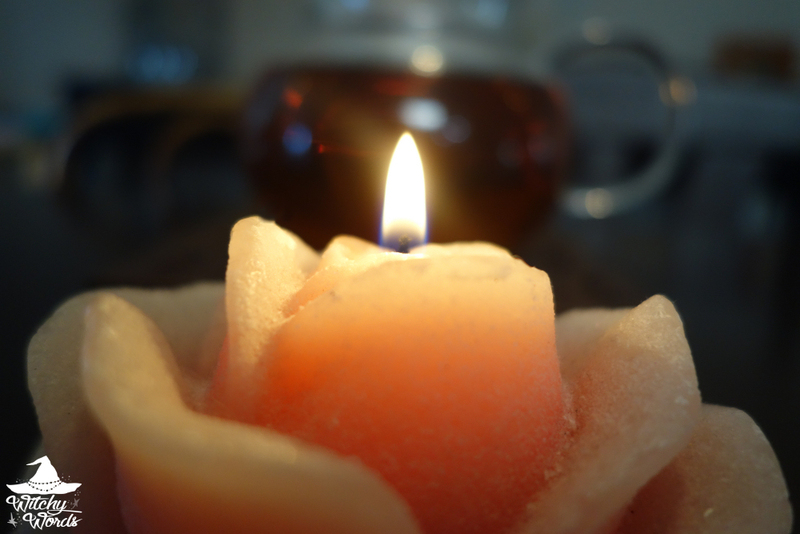 Phaedra and Andrea selected a frosted pink floral candle and two thin yellow candles. To help them stand, I placed them in taper candle holders filled with Himalayan salt. At the head of the altar, a rose quartz was placed, representing friendship and platonic love. And then lit our candles! For the ritual itself, we sat around the tea altar, taking space to relax. Andrea, Phaedra and I contemplated our friendship with appreciation and reverence. Of course, we also discussed the tea! Most notable upon pouring was the hint of bergamot oil in the air. Bergamot plays well with others and tends to be a very mild-smelling oil, such as the case here. In fact, if you're ever curious as to what it smells like, grab a bag of straight Earl Grey as its skin is often used for flavoring in these teas. The bergamot orange tends to be tart to taste but not sharp and certainly not in an unpleasant way. It's a common oil in teas that is earthy, smoky and astringent, and it has a habit of bringing out the flavors of the other ingredients. 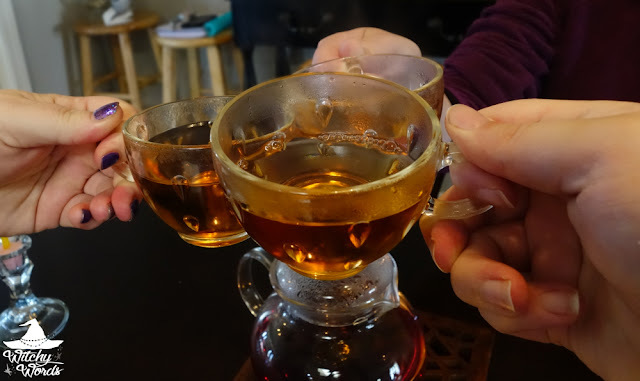 However, once you start drinking the tea, the taste is surprisingly sweet - and, despite what the description might say, I would certainly call this one sweet. The inclusion of strawberry and raspberry leaf is immediately notable, and the sweetness is enough to carry the tea on its own. You likely won't need honey or sugar with this one! That being said, the tea isn't cloyingly sweet. Rather, it strikes a good balance between the earthly tartness of the bergamot oil and black tea and the sweet, fruity flavors in the strawberry and strawberry essence. And the citrus present in the orange peel isn't forgotten, adding a hint of needed acidity to a smooth finish. Plum Deluxe offers all of their teas online for purchase here. If you're interested in this specific tea to replicate our ritual (or to enjoy on your own! ), click here! And, of course, I'd be amiss if I didn't mention that Plum Deluxe offers their very own Tea of the Month Club. For just $10 per subscription, you'll receive a 1 ounce packet of a custom seasonal loose leaf blend made just for the club along with a sample of one of their staple teas and access to special club member benefits. Check that out here! Overall, the strawberry Earl Grey blend that is Plum Deluxe's Gratitude Blend was a huge hit with Hivemind. And our ritual was an enjoyable break from the monotony of life, which is the staple of what Plum Deluxe is all about.